An artist's impression of the protocluster observed by ALMA reveals the central starburst galaxy AzTEC-3 along with its calmer neighbors. A star-forming cosmic powerhouse represents the best evidence of how galaxies in the early universe evolve. A dynamic galaxy more than 12.5 billion light-years away is producing stars nearly 1,000 times faster than the Milky Way. The powerful starburst galaxy, known as AzTEC-3, along with the three more relaxed galaxies around it, may represent the best evidence to date that large galaxies in the early universe grow from smaller ones, in an evolution known as hierarchical merging. The Atacama Large Millimeter/submillimeter Array (ALMA) in Chile made the active galaxy observations. Located in the direction of the constellation Sextans, AzTEC-3 is a submillimeter galaxy, shining brightly in that region of the electromagnetic spectrum while being dim at optical and infrared wavelengths. Dust absorbs the light from submillimeter galaxies, re-emitting it at far-infrared wavelengths. The traveling light waves, emitted from early in the life of the universe, are stretched by its expansion, shifting it into millimeter and submillimeter wavelengths. Using ALMA to study the galaxy in unprecedented detail, researchers were able to determine that AzTEC-3 appears to form more stars in a single day than the Milky Way forms in a year, outpacing the more sedate galaxies near it by a factor of 100. Combined data from Japan's Subaru telescope and ALMA show the AzTEC-3 region. 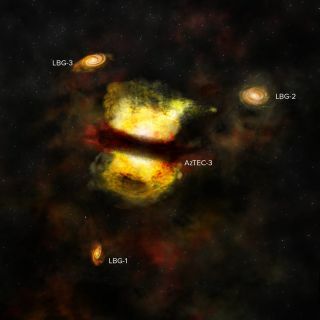 Circled objects are members of the protocluster, previously identified by Subaru, while the ALMA data are highlighted with arrows. The gas and dust in AzTEC-3 also undergoes very little rotation, suggesting that something had interrupted its motion. When combined with the high burst of star formation, the evidence suggests a recent mergerwith another galaxy. "AzTEC-3 is currently undergoing an extreme, but short-lived, event," Riechers said in the same statement. "This is perhaps the most violent phase in its evolution, leading to a star formation activity level that is very rare at its cosmic epoch." Because of the correlation between the distance and time it takes light to travel—the light they see today left the galaxy 12.5 billion years ago—astronomers are able to observe AzTEC-3 as it existed slightly more than a billion years after the formation of the universe. Scientists have long supposed that large-scale structures in the early universe formed from the continuous merger of smaller ones. Evidence for this hierarchical model of galaxy evolution has been mounting, but the ALMA data revealed a clear picture of the important first steps of this process. In addition to examining the vast powerhouse of the star-forming galaxy, ALMA also studied, for the first time, the star-forming gas in three smaller nearby galaxies. These galaxies, which produce stars at a calmer pace, are not yet gravitationally bound in a clearly defined cluster, causing scientists to refer to them instead as a protocluster. "These new observations help us put the pieces together by showing the first steps of a galaxy merger in the early Universe," co-author Chris Carilli, of the National Radio Observatory in New Mexico, added.